ALEXANDRIA, VA--(Marketwire - August 4, 2008) - Even when you try to eat healthy there are oftentimes hidden ingredients lurking. Did you know that low-fat often means high in sugar or sodium? 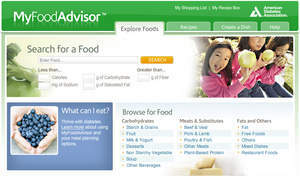 Today the American Diabetes Association (ADA) launched an online nutrition tool -- MyFoodAdvisor™ -- that unlocks the mystery of what is in many of the foods you eat at www.diabetes.org/myfoodadvisor. MyFoodAdvisor provides food information to people with diabetes, heart disease, kidney disease and those looking to lose weight. This interactive tool compares foods by 22 different nutrients, suggests healthy alternatives, and analyzes what you currently eat. Portion sizes are standardized, based on the American Diabetes Association and American Dietetic Association exchange lists so all carbohydrate-containing foods are shown in servings of about 15 grams of carbohydrate. "When health care providers tell patients to watch their carbs, eat more fiber or to avoid saturated fats, most people don't know where to start," commented Ann Albright, PhD, RD, President, Health Care & Education, American Diabetes Association. "MyFoodAdvisor takes the guesswork out of that. This tool appeals to so many looking for nutrition information: people with diabetes because of the consistent portions of carbohydrates and proteins; people with or at risk for heart disease because of the option to search by fiber, sodium and saturated fats; and people with kidney disease because potassium and phosphorous information is included, which is not listed on standard nutrition labels." Seek healthier alternatives to foods that are overall lower in sodium or saturated fat, or higher in fiber, ranking options that may provide alternatives for a meal. Browse by food category (starches and grains, vegetables) or by a specific foods (pork tenderloin). Compare foods by 22 nutrients (more than what appears on nutrition facts labels), including potassium, and phosphorus. "Sometimes the low-fat version of our favorite foods contains more sugar or sodium than the regular version or the sugar-free contains more trans and saturated fat," Albright said. "It is a good idea to have the total picture before making a decision at the grocery store." Save recipes to personal recipe box (with log in). Search for recipes by amount of calories, carbohydrate, sodium, and saturated fat. Search for recipes by main ingredient (such as salmon). "Let's say for example you are trying to watch the amount of carbohydrates you eat but also trying to increase your fiber intake," commented Albright. "You can search for recipes that meet both of those needs." Tracks all 22 nutrients consumed each day. Shows contribution of each new food to the overall dish. User can review a meal or recipe to provide clues to increased blood glucose levels. "If one person in the family has type 2 diabetes or heart disease, chances are there are others around the dinner table who could be at risk as well," said Albright. "MyFoodAdvisor can help to implement healthier food choices for the entire family." The American Diabetes Association is the nation's premier voluntary health organization supporting diabetes research, information and advocacy. The Association's mission is to prevent and cure diabetes and to improve the lives of all people affected by diabetes. Founded in 1940, the Association provides services to hundreds of communities across the country. For more information please call the American Diabetes Association at 1-800-DIABETES (1-800-342-2383) or visit www.diabetes.org. Information from both these sources is available in English and Spanish. Note to editor: Screenshots and recipes from MyFoodAdvisor are available, along with a tour of the tool with ADA's Director of Nutrition and Clinical Affairs, Stephanie Dunbar. Please contact Sarah Bradley (sbradley@diabetes.org) for more information.